Liquid Gold slot machine is a game from Microgaming that has a classic theme, that of wealth, but in this case that more revered of commodities, gold. There is a RTP of 95.37% in the mobile slot and its main selling point is the huge free games feature which can reward you with a huge 100,000 coins. To see whether this game might fit with your style of play and interests, check out the Liquid Gold slot review below for all the details. Take a journey to the centre of the earth in Microgaming’s Liquid Gold slot – a bullion-based game that benefits from a free spins feature that can potentially award up to 100,000 coins as its top prize. Boasting five lines and 20 fixed paylines, the Liquid Gold slot machine has a single-minded approach to symbol design, with all higher value icons involving the precious metal in some shape or form. Players will find bars of bullion, mining machinery and pots of gold on the reels, with even the conventional ace-through-nine playing cards receiving something of a gold-tinged makeover to keep the slot’s theme consistent. Playable from as little as £0.20 per spin, Liquid Gold allows players to select stakes of up to £2.00 per coin and a coin limit of ten coins per line. This means it’s technically possible to play the game for £20 a spin across all desktop, mobile and tablet devices if you’re feeling brave enough to risk your bankroll. In terms of bonus features, Liquid Gold is a relatively straightforward slot. The main incentive for players is the free spins game that is activated whenever three bonus icons appear anywhere in view. When this happens, not only will the feature begin, but they’ll also be awarded an instant scatter win. Players begin the feature with 10 free spins with all winnings benefitting from a 2x prize multiplier. Although you’ll notice that the bonus scatter symbols are still present on the reels, we’re sad to report that landing three of these will not award any additional free spins – only another scatter prize payout. Nevertheless, it is technically possible for players to land wins of up to 100,000x their bet per line amount, so there is still some value to be had here. That being said, the absence of retriggers does make it a slightly underwhelming feature when compared to more modern Microgaming video slots. 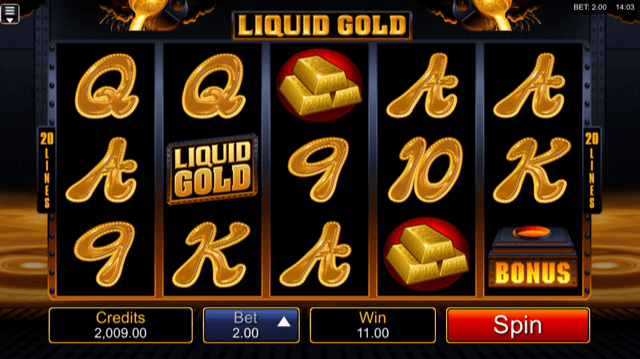 Overall, there’s not an awful lot to get excited about in the Liquid Gold slot. The game looks decent and is perfect enjoyable for a few spins, but in general it lacks the staying power to make it a viable option. If you enjoy this theme you can always try the Break Da Bank Again slot, again from Microgaming. Like our review of the Liquid Gold slot machine? Check out these as well…..